Every successful business has humble origins and the Drawing Room is no exception. What today is a thriving business with hundreds of students began with two eight year olds and a young enthusiastic graphic designer renting a small upstairs studio over a stationary store. That young graphic designer, now successful business owner is Christine Zaccardi, a lifelong resident of Wyckoff who has loved art for as long as she can remember. “I started taking art classes when I was fifteen,” said Christine, who began her training with Jock MacRae at the Wyckoff Gallery. The Wyckoff Gallery moved and became the Bengert/MacRae Gallery. Meanwhile Christine graduated from SVA snagging a top notch position as a graphic designer with The Corporate Group in downtown Manhattan. She remained friends with MacRae and helped him brand his gallery with advertising materials all the while designing logos and marketing materials for Fortune 500 companies in the tri-state area. Jock’s beloved wife Peggy passed away and Christine began making time to help with his studio and gallery. MacRae, a master painter, pastel and watercolor artist was struggling with his loss, and asked for help with his classes. He preferred teaching adults and some high school students and when the two younger students wanted to take lessons, he offered Christine the opportunity to teach. In November of 1999 Christine started teaching the two children once a week, taking off early from her regular job. By March of 2000 two became twenty-five and before she knew it parents were asking for a summer camp. Christine took a sabbatical for six weeks the first two summers, to run the camp in Midland Park, and still keeping up with the graphic design accounts -never missing a beat at either place. With the loss of her nephew on 9-11 Christine re-evaluated her life and decided to move from working in the City to focusing on her growing art studio teaching students in art the way she had been trained. 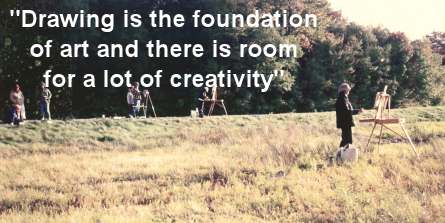 The Drawing Room was officially born as a full time occupation where Christine began devoting her energy and enthusiasm to nurturing students of all ages to be creative and many to gain entrance to the best art schools in the country. Referrals were pouring in and people were traveling from neighboring counties to take classes. Many teachers applied to help teach the rapidly expanding roster of offerings. Nancy Diehl and Jackie Bruno were referred by friends and Kymm Zak was a neighbor. Lifelong friend Patty Spinnler left Wall Street as a trader and Jaci Turner a former portfolio student, each with her own specialization. Momentum was gathering and the studio was alive with excitement as the reputation of a New York quality education was gaining ground. Christine had studied plein air (outdoor or onsite) painting with MacRae and began giving weekly classes at the Environmental Center in Wyckoff which became very popular as no other art schools in the area ran them. She also developed a multi-media style approach, preferring to give students instruction in various materials with a strong foundation in the basic skills of drawing, painting and design. Portfolio development began with a handful of students growing to hundreds of students who began at the Drawing Room because they found their own middle school or high school programs to be lacking. Today the Drawing Room is a thriving business having expanded its studio classes to teaching in afterschool programs at the Ridge School in Ridgewood, Colonial Road, Woodside and High Mountain Schools in Franklin Lakes, the Village School in Waldwick and Hohokus and many more. The teachers are certified to complete Scout Badges. We work with a spectrum of challenged students. Birthday Parties, Mom and Me, Ladies Night Out, Charitable events, Portfolio, any groups or private lessons-“We do it all!” says Christine who even ran a birthday party for an eighty-year old woman who with a dozen of her friends created phenomenal selfportraits. Her enthusiasm is catching. When asked where the name The Drawing Room came from Christine replied, “Drawing is the foundation of art and there is room for a lot of creativity. Christine’s warmth, talents, resourcefulness and generosity have paved the way for this unique place to survive, despite many ups and downs in the economy and many students return year after year to visit, intern or get advice. She has a big heart and plans on expanding her business into non-profits for more involvement in the community.